Students stopped by for free pumpkins and fall feeling at Pumpkin Fest. Photo by David J. Hawkins. Paint and stencils were available to decorate their free pumpkin. Photo by David J. Hawkins. 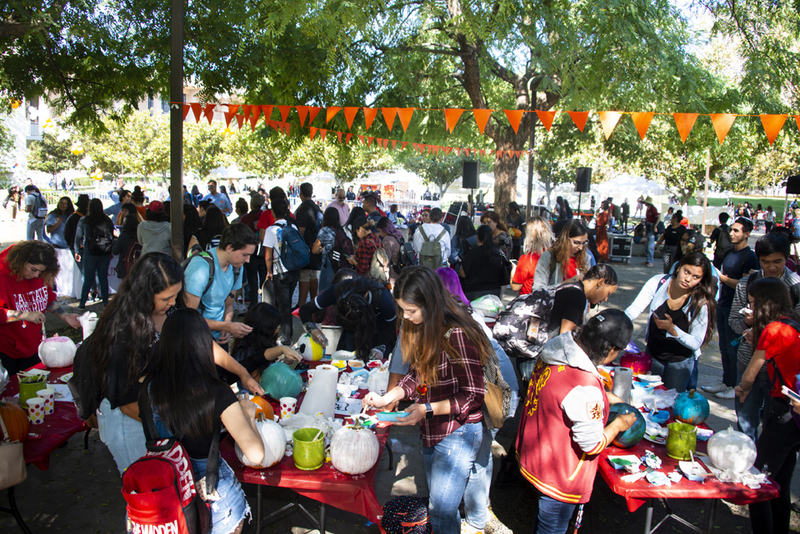 At Pumpkin Fest, students got to be creative with free pumpkins. Photo by David J. Hawkins. A Zombie Apocalypse checkpoint. Photo by Patricia Carrillo. 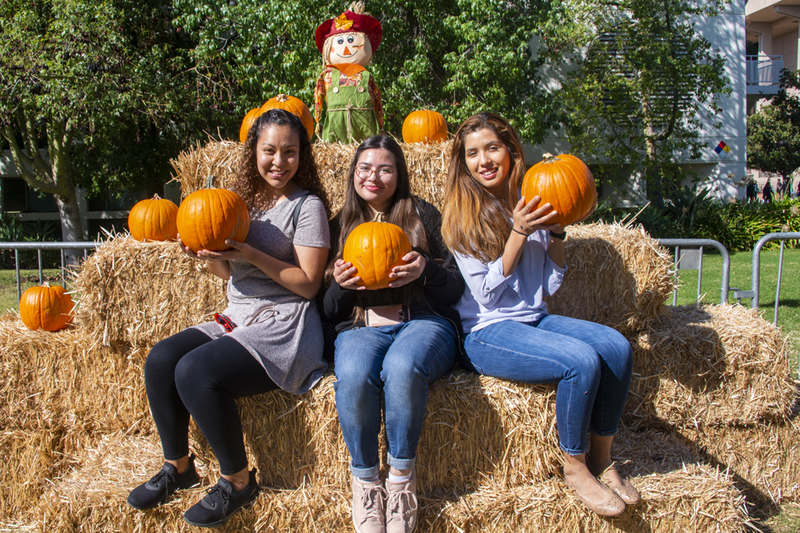 The Associated Students, in collaboration with the University Student Union, brought the Halloween festiveness to Matador Square with a vibrant pumpkin patch, complete with hay bales, scarecrows, a corn maze and much more. Free to attend, Pumpkin Fest treated students and staff with cookies, cider, chocolates and free pumpkins. Anyone who felt creative could even engage in some pumpkin painting. 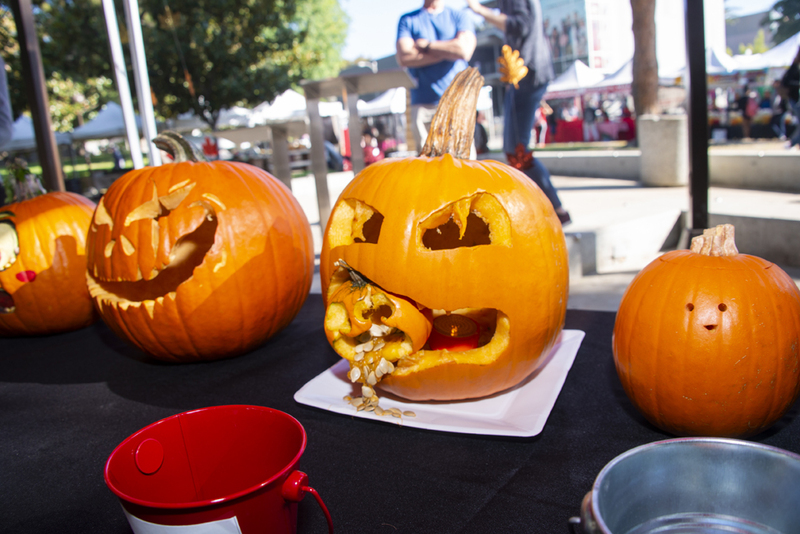 Pumpkin enthusiasts voted for their favorite carvings in a pumpkin carving contest that awarded its best carvers a Starbucks gift basket (3rd place), and tickets for Knott’s Scary Farm (2nd place) and for Universal Studios Halloween Horror Nights (1st place). Exercise can be terrifying, but the University Student Union Student Recreation Center gave that concept a whole other meaning. 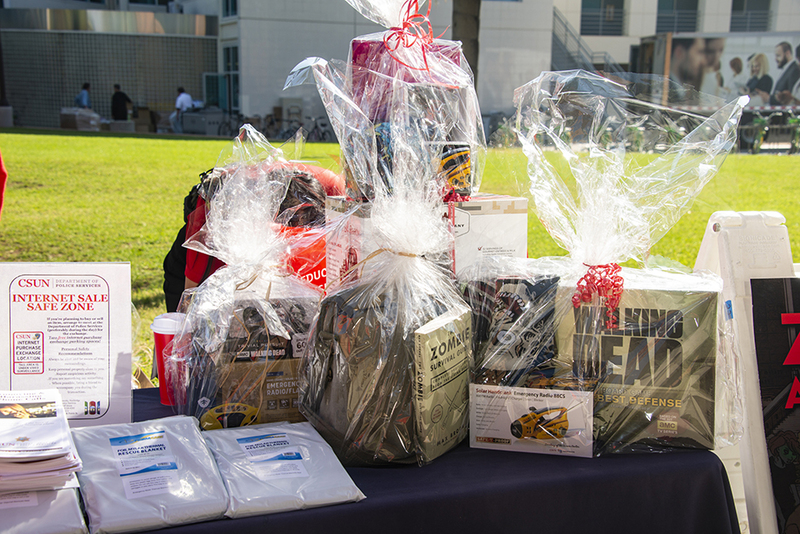 Halloween-themed group exercise classes took place for an entire week at the SRC. Getting hearts racing from the Halloween horror — and maybe from the cardio — the “spooktacular” classes included Fang-tastic Zumba, Boo-tiful Barre Fit, Mysterious Matador Cycle, Cast a Spell Cardio, Pumpkin Patch Pilates and Afterlife Afro-Caribbean Heat 45. The University Student Union transformed the familiar Northridge Center into a spine-tingling, bone-chilling town set in the middle of colonial America. While enjoying a delicious dinner they hopefully kept in their systems, those who attended Matador Horror Story were plunged into this thrilling atmosphere where they uncovered clues to solve a chilling serial killer mystery. The interactive theatre spectacle, inspired by hit TV series American Horror Story: Coven, with its witches, black crows and severed heads in jars, proved to be a unique experience for CSUN students to have fun with friends and get into the spirit of Halloween. 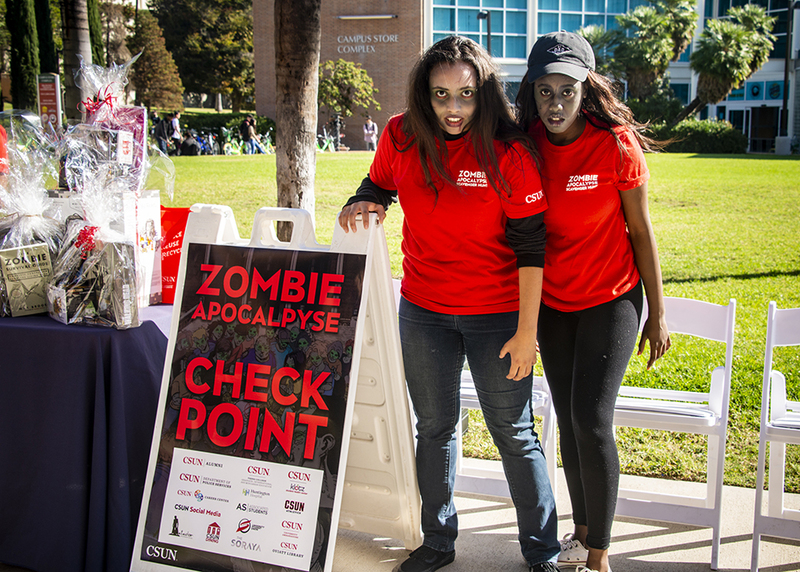 In this campus-wide scavenger hunt, the mission was to collect tools to increase your chances of surviving a zombie outbreak. The scavengers, using a map and a punch card, searched for 12 checkpoints where they could obtain an array of survival items, such as emergency blankets, water bottles, mini-first aid kids, mini tool cards, flashlights, emergency communications cards — items that are useful for any natural disaster … even the zombie apocalypse itself. The Halloween festivities are coming to a close, and the Delmar T. Oviatt Library wants a slice of that pumpkin pie. The Oviatt is currently hosting Frankenweek to celebrate the 200th anniversary of Mary Shelley’s illustrious Frankenstein, which was first published in 1818. The week-long celebration features a variety of activities devoted to recognize the novel’s enduring value in contemporary society. If you walked into the front doors of the Oviatt this week, chances are you were greeted by mosaic of bright green flashcards and vibrant red yarn, and a few friendly faces telling you how you could take part. Frankenweek kicked off with Suturing Sentences, the name of which is both a reference to Frankenstein’s famous stitches and an apt description of what to expect in it. Using flashcards and yarn, participants channeled their inner Mary Shelley to stitch together sentences from Frankenstein, in any combination they wanted—no matter how wild—to craft their own monster novel. 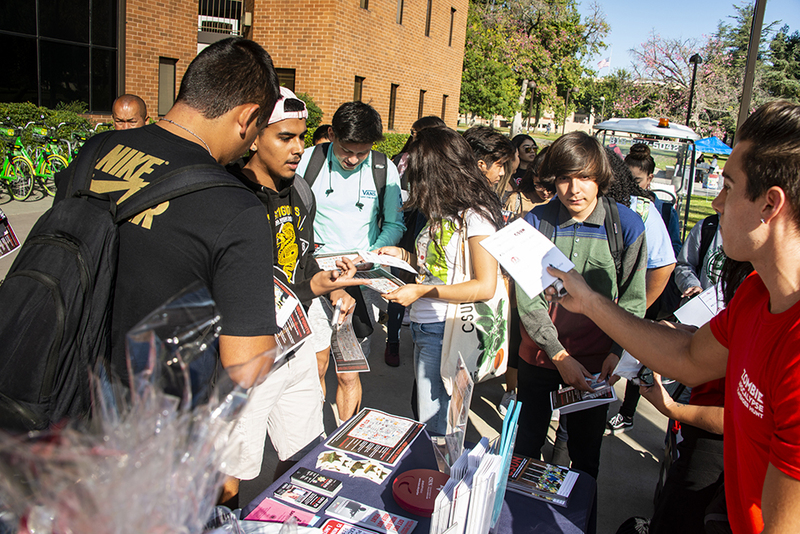 CSUN’s Halloween celebrations haven’t died just yet. 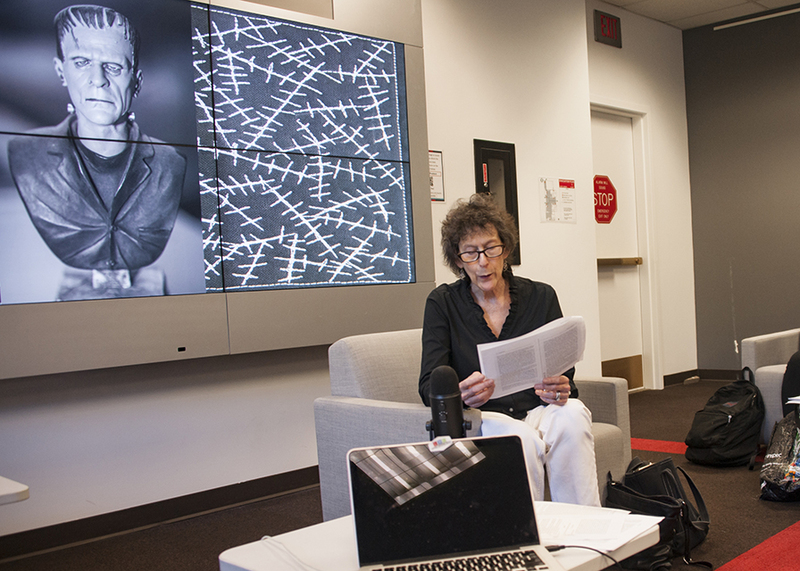 On Halloween Day, the Monster Challenge is a cover-to-cover read-through of Frankenstein. Attendees can listen to the non-stop reading of the classic tale, and even sign up to read sections of the novel for 10 minutes. 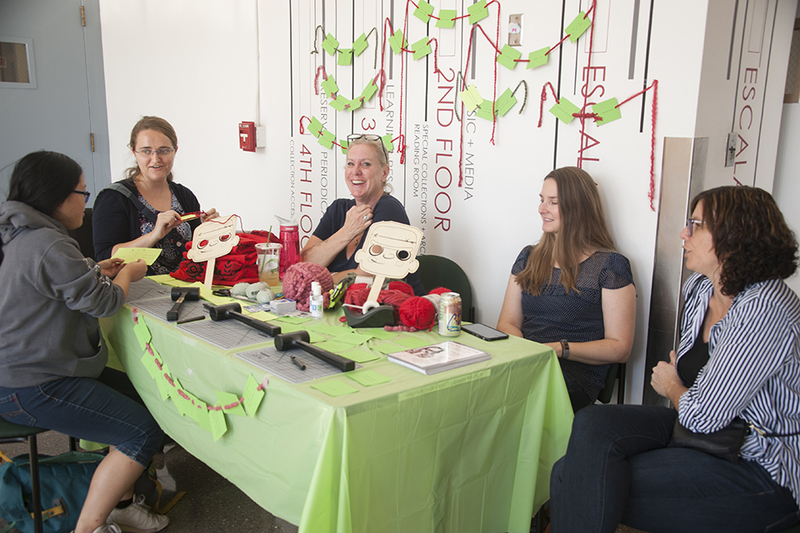 The spirit of the holiday lives on as Frankenweek continues with Suturing Sentences, at the Oviatt Library Main Lobby, will also continue until Thursday, open from 11 a.m. to 3 p.m.